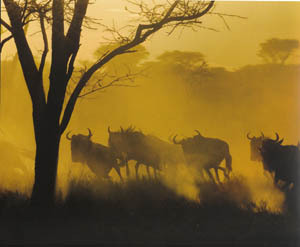 The organised tours offer safari lodges and tents. Both are permanent structures with private showers and toilets. If you choose to design a tour your self you can choose to go to a public camping site. These are set in the wilderness and are supported with basic necessities only. We will provide camping gear like mattresses, chairs, tables, etc. We use light tents for camping and the cook we provide travels with you and takes care of all camping chores. In Stone Town we can provide a quality guest house for you to stay at, complete with all modern amenities. At Kendwa rocks we can arrange for you to stay at an excellent guest house. This is a two minute walk to the sea. Mosquito nets, running water, light and a balcony are provided with each room. Guests can stay in either a twin room or double. Breakfast is included. You will have a choice of accommodation in Longido village. You can either stay at Mr. Alley's Guest House or in luxury tents. Both provide basic washing facilities, all of your meals, bed and board and mosquito nets. Please put photos, see attachments 0435, - luxury tents 0439, 0482,0483- views from luxury tents, 0450-Mr. Alleys Guest House. Help us to achieve our goals by volunteering to install water projects or by making a donation.